* NSCAA Southeast All-Region First Team (2013). * NCAA All-Tournament Team (2013). * All-ACC Second Team (2013). * ACC All-Tournament Team (2013). * Weekly Honors: ACC Player of the Week (9/4/12); TopDrawerSoccer.com Player of the Week (9/3/12, 9/17/13); NSCAA Player of the Week (9/3/12); Soccer America Player and Team of the Week (9/3/12); TopDrawerSoccer Team of the Week (9/3/12, 9/17/13). 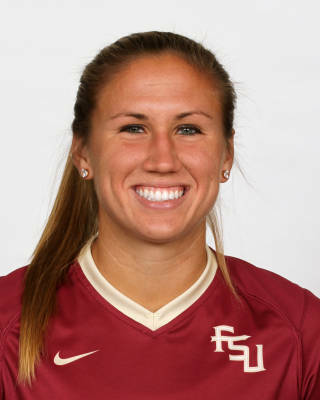 * One of just three Seminoles to start all 28 games in 2013 leading Florida State to a third straight appearance in the College Cup and a berth in the national finals. * Honored as a first team All-Region by the NSCAA…named a second team All-ACC honoree. * Tallied the third most minutes on the pitch recording 2,599…started every minute of 27 of the 28 games she played including 26 straight matches to end the season. * Finished the season with eight points on four goals as three of those four goals were scored in the postseason including two in the NCAA Tournament. * Two of those four goals came against Duke as her first points of the season came on a goal in the 87th minute to break a 1-1 tie to give the Seminoles their first victory over the Blue Devils in Durham in 10 all-time opportunities. * Second goal against Duke came in the first round of the ACC Tournament finding the back of the net in the 53rd minute to give FSU a two-goal lead. * Added goals in the NCAA Tournament against Colorado (third round) and Virginia Tech (semifinals)…goal against the Hokies in the national semifinals came off a set piece connecting on a diving header in the 42nd minute to tie the match at one. * Recorded 30 shots to tie a single-season career-high set during her sophomore campaign in 2012…finished with 13 shots on goal for a .433 shots on goal percentage. * Tallied a season-high three shots in a 1-0 win against NC State including two on goal…tied a career-high by putting two shots on goal four times in 2013 (Oklahoma State, at Duke, NC State and Virginia Tech in the College Cup). * Started all 24 games in helping FSU to its second straight College Cup appearance and sixth trip overall…one of just four Seminoles to start every game in 2012. * Twenty-three of her 24 starts came in the Seminole backline. * Helped FSU string together nine straight shutouts – a school record and tied for the 13th longest streak in NCAA history – and a consecutive minute shutout streak that lasted 934:09 (school record). * Posted single-season career-highs in every offensive category during her sophomore season including goals (5), assists (6), points (16), shots (30) and game-winning assists (2)…tied a single-season high with two game-winning goals. * Ranked third on the team in goals scored and points and fourth in assists and shots. * Garnered National & ACC Player of the Week honors after tallying both game-winning goals in wins over Florida and the College of Charleston…was instrumental in leading the Seminoles to back-to-back shutouts as she played all 90 minutes in the backline. * First multi-goal game came against Jackson State on September 21…finished the match with a career-high five points on two goals and an assist. * Registered her first goal in ACC play on the road at Boston College scoring the first goal of the game on a header in the 37th minute putting away a corner kick from Carson Pickett. * Tallied an assist in three straight matches including both games of the ACC Tournament – quarterfinals at home against Boston College and in the semifinals against Virginia. * Made an outstanding individual effort to gain possession of the ball in FSU’s offensive third which led to the game-tying goal against Penn State in the national semifinal…after battling with two Nittany Lion players for the ball, emerged with possession before lofting a cross inside the box that Tiffany McCarty flicked a header inside the left post for the score to tie the game at 1-1 with 41 seconds left in regulation. * Led the team in minutes played (2180) and was the only Seminole to play every minute of every game. * Appeared in all 26 games and made 12 starts including 11 straight to close out the season. * Tied for the eighth-most points on the team with nine on three goals and three assists. * Scored the game-winning goals against North Florida and Mercer – tied for second on the team with two game-winning goals. * Posted a season-high three points on a goal and an assist in a 4-0 win over Mercer. * Assisted on two goals in a road victory at Clemson…was one of four Seminoles to record a multi-assist game on the year. * Started and played every minute in the final 10 games of the season including all three games in FSU’s run to its first ACC Championship and in all five games as the Seminoles advanced to the College Cup. * Recorded a season-high four shots in back-to-back NCAA Tournament wins over Samford and Portland. * Scored in the second half of FSU’s NCAA Tournament second round game against Portland in Memphis…goal gave the Seminoles a commanding 3-0 lead. * Called into camp with U.S. U-23 squad summer of 2013 – first invite by the U.S. National Team at any level. * Earned second invitation to training camp with U-23 team in June of 2014 at the U.S. Olympic Training Center in Chula Vista, Calif.
* Led Melbourne High School to back-to-back 6A state titles as a sophomore and junior…tallied 64 points during her freshman year scoring 28 goals and eight assists in leading the Bulldogs to the state semifinals. * Dairy Farmers Girls Soccer 6A Player of the Year and the Florida Girls High School 6A Player of the Year for the 2008-09 season. * In her four years at Melbourne, scored 112 goals and 54 assists. * Selected to the ESPN RISE All-America team in 2008-2009. * Served as President of the National Honor Society, Student Body Vice-President…graduated high school with a 4.1 GPA. * Daughter of Dinah and Mike Grubka. * Has a sister Michelle. * Arrived on campus in January 2011 enrolling at FSU for spring semester.